Let go of the sensual you once were and the sensual you think you should be and find out exactly what feeds your senses, desires, and needs now. 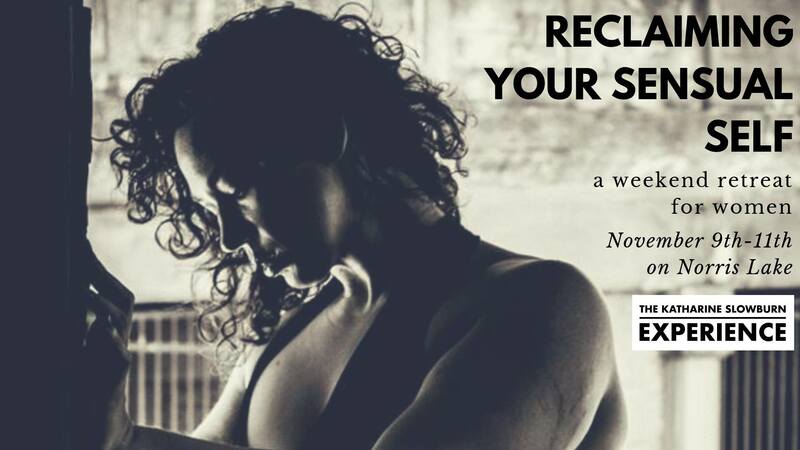 Whether you're starting your sensual journey, at a new or different phase of your life, trying to connect to something lost, or just want to know your sensual self more, this retreat is for you. We'll be connecting through dance, writing, community sharing, yoga, and more. You'll leave feeling more confident and empowered, ready to claim your joy and desire in this world. Most importantly, you'll get to know fellow awesome women and build a community of support that can remind you of your brilliance. ... Oh... and did we mention the hot tub, fire pit, and private dock? Pricing includes programming ($200 value), all meals, and accommodations. Early Bird Registration opens Friday, 9/21 and pricing ranges from $250-$400, based on bed size/room arrangement. About Katharine Slowburn: Katharine Slowburn, M.A., MDiv, founder and director of The Katharine Slowburn Experience, hails from Knoxville, TN but escaped to California to chase her dreams of becoming a music video choreographer at 18. Alas, that didn’t pan out quite the way she hoped. So, she made the leap from Hollywood to Harvard (there were some stops in between), where she focused on dance, body image, and spirituality and received her Master of Divinity from Harvard Divinity School. Now, Katharine continues to blend dance together with spirituality in a very human way. She believes that whether a person is pelvic thrusting or bowing down, the embodied experience offers the opportunity to build resiliency, community, and joy in the face of a unpredictable world.